7.6 What is the Gridwise Architecture Council? 9 Enabling technologies and technical solutions for the Energy Internet: lessons learned and case studies from Pecan Street Inc. 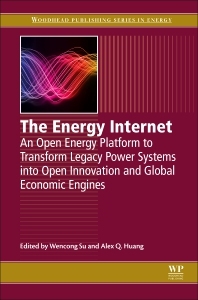 The Energy Internet: An Open Energy Platform to Transform Legacy Power Systems into Open Innovation and Global Economic Engines is an innovative concept that changes the way people generate, distribute and consume electrical energy. With the potential to transform the infrastructure of the electric grid, the book challenges existing power systems, presenting innovative and pioneering theories and technologies that will challenge existing norms on generation and consumption. Researchers, academics, engineers, consultants and policymakers will gain a thorough understanding of the Energy Internet that includes a thorough dissemination of case studies from the USA, China, Japan, Germany and the U.K. The book's editors provide analysis of various enabling technologies and technical solutions, such as control theory, communication, and the social and economic aspects that are central to obtaining a clear appreciation of the potential of this complex infrastructure. Dr. Wencong Su received his B.S. degree (with distinction) from Clarkson University, Potsdam, NY, USA, in May 2008, his M.S. degree from Virginia Tech, Blacksburg, VA, USA, in December 2009, and his Ph.D. degree from North Carolina State University, Raleigh, NC, USA, in August 2013, respectively, all in electrical engineering. Dr. Su has been an Assistant Professor in the Department of Electrical and Computer Engineering at the University of Michigan-Dearborn since September 2013. He previously worked as a Research Aide at Argonne National Laboratory in IL, USA, from January to August 2012. He also worked as a R&D engineer intern at ABB U.S. Corporate Research Center in NC, USA, from May to August 2009. His current research interests include power and energy systems, energy internet, electrified transportation systems, and cyber-physical systems. Dr. Su has published more than 80 papers in journals and conference proceedings. He is a registered Professional Engineer (P.E.) in the State of Michigan. Dr. Alex Q. Huang received his B.Sc. degree from Zhejiang University, China in 1983 and his M.Sc. degree from Chengdu Institute of Radio Engineering, China in 1986, both in electrical engineering. He received his Ph.D. from Cambridge University, UK in 1992. From 1994 to 2004, he was a founding member and a professor of Center for Power Electronics System (an NSF ERC) at Virginia Tech. From 2004 to 2017, he has been the Progress Energy Distinguished Professor of Electrical and Computer Engineering at North Carolina State University. At NCSU, he established the NSF ERC Future Renewable Electric Energy Delivery and Management (FREEDM) Systems in 2008. As part of the FREEDM System concept, he developed the original concept of Energy Internet with the Solid-State Transformer serving as an Energy Router. Today, FREEDM Systems ERC is one of the most successful ERCs in the USA with support from many companies. Dr. Huang was also the lead PI and visionary leader behind the establishment of the PowerAmerica Institute which focuses on the development of wide bandgap power electronics technology. Dr. Huang is currently the Dula D. Cockrell Centennial Chair in Engineering at University of Texas at Austin and the Director of the Semiconductor Power Electronics Center (SPEC). Dr. Huang’s research areas are power semiconductor devices, power management integrated circuits, power electronics and its emerging applications such as those in future electric power delivery and management systems. A very active and productive research leader, Dr. Huang has mentored and graduated more than 80 Ph.D. and master students and has generated more than $200m external R&D funding in the last 20 years. Dr. Huang has published more than 550 papers in journals and conference proceedings, and holds 22 US patents. Dr. Huang is the inventor and developer of the ETO thyristor technology. Dr. Huang is a fellow of IEEE and the recipient of the prestigious 2003 R&D 100 award and 2011 MIT Technology Magazine awards. Dula D. Cockrell Centennial Chair of Engineering, University of Texas at Austin, USA.